When Gideon Ariel opens the door to the computer room. In one corner an assistant has projected a tennis player, stopped in motion, on what is called a digitizing screen. With a special pen, he touches the player's toes, knees, hips, shoulders and head and traces the form of the tennis racquet. As he does, a stick figure takes shape on the computer screen. When he is finished, he moves on to the next frame of the film and repeats the process. On another computer screen we take the group over to another computer con­sole and puts two stick-figure horses on the screen, making them run from one side to the other. "That doesn't tell us too much," he says. "But now, if I put it on multiple frames and do the same thing"—he runs the horses across the screen again, but this time leaves the images of 30 overlapping horses in motion—"we see that this horse has more vertical displacement than this horse. This horse runs straight. This horse runs up and down. A horse going up and down usually will not be as fast because he is losing energy. When I look at this horse—this is a good horse—I can see a big hole between his legs. That means he has very little lateral motion. Now I can also look at this horse from on top." He rotates a squiggle stick and the image on the screen rotates from side to top view. From the top, he runs the horse through its paces again. The horse trainer kicks at the floor with the point of his boot and asks, as politely as he can, "Wouldn't a racing form tell you the same thing? What's the ad­vantage of filming and digitizing over the naked eye of a man who's been around horses twenty years? I can tell if a horse stands bad ..."
"How do we know it stands bad?" asks Ariel. "Maybe it stands great, but just looks bad. How it looks to the eye means nothing. I could take a ballerina; she would throw a shot so beautiful, and the shot might land two feet from her. But I could show you a champion shot-putter; when he threw a shot, if you didn't know where the shot landed, you would say the guy was nuts, didn't know how to throw the shot. But when you put the data together, it's perfect. What makes a horse move are forces, not how he looks. And forces you cannot see with the eyes. You have to calculate. And that's what we do." 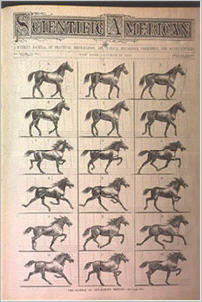 The first equine biomechanics probably started with Eadweard Muybridge's work at Stanford University between 1877-1878. Race Horses Biomechanics or as it is called Equine biomechanics is the study of biomechanics as it applies to horses. The principles of analyzing horses is very similar to the analysis of Athletes. What is differences are the number of joints to be traced during the movement. Many of the same techniques are also used, including digitization of the movement and similar computer programming to analyze the gait. He is known for his pioneering work on animal locomotion which used multiple cameras to capture motion, and his zoopraxiscope, a device for projecting motion pictures that pre-dated the flexible perforated film strip. To solve the problem Muybridge improved on a recent invention in speed photography developed by John D. Isaacs (who developed the capability to film in quick sequence) and set out to photograph one of Stanford's horses trotting. The method they used were 24 still cameras firing at particular time sequence so each frame capture in the camera was separated from the previous one by specific time. Muybridge was hired by Leland Stanford, the Stanford University benefactor, who had decided to challenge a common belief at the time (late 19th century) that when a horse trots at least one foot is on the ground at all times. Stanford thought that all feet left the ground at one point in the cycle. 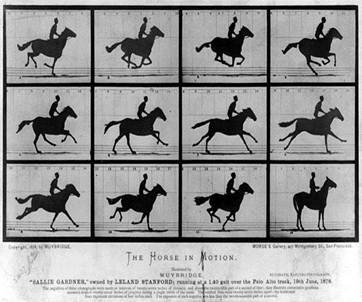 Muybridge used a series of large cameras that used glass plates placed in a line, each one being triggered by a thread as the horse passed. Later a clockwork device was used. The images were copied in the form of silhouettes onto a disc and viewed in a machine called a Zoöpractiscope. This, in fact became an intermediate stage towards motion pictures or cinematography. The results showed that all four feet did leave the ground, a finding which gave Stanford credibility as a horse man and also put Muybridge on the map in the area of speed photography. Muybridge's success brought him national and international fame. Scientific American, and others, published articles about his work, and his breakthroughs unwittingly started the motion picture industry. Unfortunately Stanford and Muybridge had a falling out with lengthy legal battles. Leland Stanford commissioned an analysis of the pictures which Muybridge had taken and the resulting analysis plus photos were published in a book called "The Horse in Motion", but Muybridge was not given credit in the book for his work. In 1874, still living in the San Francisco Bay Area, Muybridge discovered that his wife had a lover, a Major Harry Larkyns. On 17 October, he sought out Larkyns; said, "Good evening, Major, my name is Muybridge and here is the answer to the letter you sent my wife"; he then killed the Major with a gunshot. Muybridge was put on trial for murder. One aspect of his defense was a plea of insanity due to a head injury that Muybridge had sustained following his stagecoach accident. Friends testified that the accident dramatically changed Muybridge's personality from genial and pleasant to unstable and erratic. The jury dismissed the insanity plea, but he was acquitted for "justifiable homicide". (Thanks God, I did not live at that time, I would be dead at least 8 times…) The episode interrupted his horse photography experiment, but not his relationship with Stanford, who paid for his criminal defense. After the acquittal, Muybridge left the United States for a time to take photographs in Central America, returning in 1877. He had his son, Florado Helios Muybridge (nicknamed "Floddie" by friends), put in an orphanage. Muybridge believed Larkyns to be his son's true father, although as an adult, the son bore a remarkable resemblance to Muybridge. As an adult, Floddie worked as a ranch hand and gardener. In 1904 he was hit by a car in Sacramento and killed. Equine biomechanics has evolved significantly since Muybridge's days, and currently impacts several fields in equine management, including injury prevention and treatment, performance enhancement, and spans several equine sports. Important gait differences occur in time intervals impossible to see with the naked eye, or even with regular video. For hundreds of years people have been asking "what is it that makes one horse run faster than another". This question is at the heart of biomechanics as applied to thoroughbreds. Biomechanics as applied to thoroughbred performance focuses mainly on the biological fuel system and the mechanical systems. The field of equine biomechanics is using high speed video to film thoroughbred horses at racing speeds and have begun using this as the basis for detailed gait analysis which examines stride length; energy usage; leg angles; shoulder, neck and joint positions; hoof movement patterns, etc.. It also looks at the relative positions of the limbs at each phase of the stride and the timing of each hoof placement. This kind of detailed analysis would simply be impossible with the naked eye, and is enabling new insights into the understanding of why one horse runs faster than another. When a sprinter run, the movement caused by displacement of his/her rotational leg and hips segments. The displacement of the ankle joint is added to the displacement at the knee joint and the hip joint and in addition, a small rotation at the Pelvic joint. When you add all these angular displacement it creates the total stride length. However, the net distance always is less since some motion is wasted at the contact with the surface, and some motion is “absorbed” at the flexible shock absorbing joints. In addition, air resistance will resist the movement forward. To the displacement. In addition, the flight in air time and how high the center of gravity displaced, affecting the total result. However, the most critical movement which created the forces to move forward is at the Ankle, Knee and the Hip joints. By calculating the angular velocities at these joints, one can calculate the “absolute” velocity and compare athletes that ran at different time and different conditions. For example, an athlete may run 10.0 seconds the hundreds meters sprint, but another athlete would run at 10.20 the same race but with a resistance wind, and in fact when calculate their speed by adding the angular velocities at the joints, they may be really equal in their “absolute” speed. This how we found, that Jessie Owens was as fast as today sprinters at 9.7 seconds running on an artificial surface with special sprint shoes. I remember meeting Jessie Owens in one of the World Championship in Track and Field and he introduced himself to me and told me how much he appreciated my study that was published in Track and Field Quarterly Review Journal. What a great athlete he was. The same techniques could be applied to analyze race horses and determine their “joints speed” that correlated to their actual speed on the track. We know that horses race on soft sand to minimize the forces that transmitted to their joints to minimize injuries. However, “sinking in the sand” effect the “Net” velocity of the horse. Some energy is lost at this “shock absorbing” mechanism. Also, one may ask the question, why the velocity at the hip joint changing dramatically from the morning “Breezing” training time to the afternoon, racing time. What if the Joint angular velocity reduced by 40 percent? What caused it? Maybe drug? We could measure these parameters with the APAS system. In early 1980 I had a call from a person by the name Irvin Pollack from Florida. He mentioned that he heard about my Motion Analysis System the APAS and wondered if I could visit with him. He told me that he owned about 50 horses in a big farm and I will have a good time to visit with him. He assured me he will pay for all the expanses. Week latter I was flown to Miami. A black limousine with a big driver wearing dark lenses glasses greeted me at the gate. Oh, Oh, where did I arrive to? I was worried. In the limousine was another person that work for Mr. Pollack, he offered me some alcoholic drink. I told him that I am not drinking. At that time I was thinking about Ann if I will ever see her again. We arrived at the Fountain Blue hotel. Mr. Polack greeted me shake my hand and invited me to get to the hotel. We met in some suite that looks to me at the time as if we seating in another World. “How do you like my Hotel?” Mr. Polack asked me. Well I told him how impressed I am. He introduced me to two of his horse trainers that came to visit with us. I explained to them how I am using my motion analysis system to analyze the Olympic Athletes. They knew about me and acknowledge their acceptance of the method. In general, Mr. Polack wanted to know if I could analyze his horses and give him information which horse had more potential and in addition to analyze all the other competitors horses so he will know how to bet against them. He even offered me percentage of the win money, which I refused. I told him that I will charge him per analysis but do not want to be part of the betting. After few hours of conversation and agreement about the price of the project, we decided to go to dinner at the Newport hotel in north Miami. We arrived in a beautiful restaurant and were taken to a large round table. Few people already were waiting for us. I was introduced to all of them but well remember two of them. 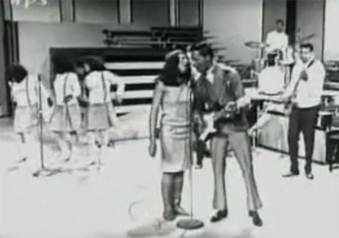 One was Ike Turner and his girlfriend at the time Tina. They were not as famous at that time, but perform for Mr. Polack at the Newport hotel. After a great dinner and great performance by Ike and Tina, Mr. Polack invited me to his home. This was a very large home. I would guess at least 20,000 square feet with many rooms. We were greeted by Mr. Polack girlfriend, a very young beautiful lady and his Chinese cook. We were seating for after dinner desert and a drink. I comment to Mr. Pollack how beautiful his house is, and he told me that this house was owned by Al Capone who lived in this house most of his successful years. Well I was wondered now if I will be able to sleep at night since the next day in the morning we were supposed to drive to Mr. Pollack’s farm to see his horses. Next morning we drove in the limousine to the farm. I was introduced to number of trainers and saw all the beautiful horses. Some of them were very famous. The present biomechanical analysis of thoroughbred horses was designed for several purposes which include identification of characteristics which contribute to successful racing. In addition, attention will focus on the isolation of those factors which can be manipulated in order to optimize a horse and, thus, improve the chances of winning. Research on the available information revealed that the field of horse racing is in the Dark Ages with most knowledge based on hearsay, guesswork, and tradition. Few people incorporate scientific knowledge, such as physiology or physics, in the training regimen. Since all objects on earth must obey the same laws of motion, the forces created by and acting upon horses depend on biomechanical characteristics. The objective is to identify those parameters that will optimize selections of new horses, training of young as well as active animals, and maximize the forces produced in the performance. The present study utilized a biomechanical analysis system whereby high speed cinematography was initially processed with a sonic digitizer with subsequent computerized data calculations resulting in three dimensional analyses. The graphic system permits many features including real-time scaling and rotation in three dimensional space. This sophistication allows examination and measurements in any plane of motion, such as the view underneath, overhead, side, or any combination of these views. To analyze a horse, the question arises regarding the importance or significance of the various parameters relative to their contribution to a successful running motion. Twelve horses were analyzed as a pilot study to identify these parameters which appear to contribute significantly to the speed of the horse. The kinematic analysis consisted of the determination of positions, angles, and contact time on the ground, duration of the airborne phase, as well as the velocities and accelerations of the different body segments. From this analysis, the contributions of these parameters can be determined. The preliminary analysis revealed the importance of the following factors in the running performance of the thoroughbred horses studied. This parameter means the time that each foot is in contact with the track. The shorter the contact, the greater the magnitude of the force with which the horse pushes against the ground. For example, if a particular horse produces a contact time of 94 milliseconds, it is faster than one which has a 100 millisecond contact time. Assuming that all other factors remain the same, horses with shorter contact time would be faster. This factor concerns the duration of the airborne phase which occurs when all four feet are off the ground. It should be remembered that the horse can propel the body forward only when it is contact with the ground. No forward thrust can occur during the flight phase since the horse has nothing to push against, and must "wait" until returning to earth by the speed of the earth's gravitational pull before being able to exert forward thrusting efforts. Since all horses are subject to the same gravitational effects, a horse which can spend less time in the air and more time pushing against the ground will obviously run faster. To optimize this parameter, the horse should have a long stride with a short airborne phase. A long airborne phase may be caused by the horse pushing upward rather than forward which would result in a longer time in the air. Thus, it is important to minimize the up and down fluctuations of the center of gravity of the horse The better horses maintain the center of gravity on approximately a level plane, that is, with little wobble or bounce up and down. Therefore, the optimal air phase time was determined to be one of short duration. The better horses exhibited a long stride with a short airborne phase. This can be accomplished by applying greater force at the legs. It seems that consideration should be given to the relationship between the airborne phase and the stride length. Since these parameters are closely related, it may be that the ratio between the two is a more important factor in determining the better horse than either considered alone. This ratio of stride length to airborne duration should be greater in the faster horse. In other words, the longer the stride coupled with a shorter airborne phase, the greater the resulting speed. Further research is necessary for conclusive confirmation, but it appears that this parameter changes for the horse during the race as fatigue sets in. Fatigue causes the stride length to shorten while the airborne phase remains approximatey the same. This phenomenon revealed interesting information. After pushing off with the rear legs which propel them into the air, the better horses actively bring the rear legs forward in preparation for the next stride. The slower horses appear to "relax" and wait longer before moving the rear legs forward. It seems the slower horses utilize some of the energy from the impact of the front legs to snap the rear legs forward. This "lazy" technique results in a loss of energy. Therefore, the sooner the horse contracts the rear legs after the completion of the push-off, the more efficient the movement. Another possible reason for this phenomenon is that the longer the horse allows the rear legs to stretch, the greater the angle of impact and, therefore, the greater the force of the forelimbs impacting the ground upon contact. The force of this impact functions as a brake and the longer the delay in rear leg activation and the more acute the impact angle, the greater this "braking" force. Therefore, it is an advantage for the horse to activate the rear legs as rapidly as possible. The optimal condition appeared when the horse landed with the angle of the forelimb nearly perpendicular. At this angle, little stopping or braking force from the ground slowed the horse's forward motion. The greater the deviation of the impact angle from perpendicular, the greater the deterrent force to the movement forward. Also, the linear velocities of the various foreleg joints should be approximately equal. This relationship allows a smooth transition in stride and increases the horse's efficiency by reducing braking forces associated with ground impact. Horses with less coordinated velocity patterns produce landing forces which are transmitted through the leg and often result in large shoulder joint forces which are opposite to the direction of movement and, thus, slow the horse. It was found that in the better horses, the body angle remained nearly parallel to the ground. Slower horses demonstrated a rhythmic change in the angle up and down as the horse "rocked" in the plane of motion in a manner like a teetertotter. This rotation caused the head to wobble up and down and also increased the energy expenditure. 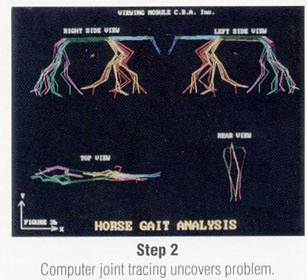 Synchronization of front and of rear legs It is assumed that there must be optimal synchronization between the two rear feet, between the two front feet, and among all four feet; however, objective evidence must be collected to test the veracity and validity of the assumption. At this point, it appears that various horses synchronize the landing in slightly different manners. For example, some horses time the impact of the two rear feet so that there is only a short time period between the foot contacts. Other horses demonstrate a longer delay in this foot impact sequence. These patterns are not necessarily identical between the rear and front legs but are probably fixed for each horse. Presumably there is an optimal pattern. The information presented in the paragraphs above are the initial results from this pilot study. 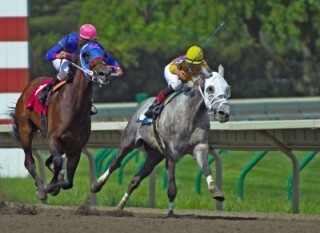 The ultimate goal, of course, is to identify the characteristics produced by horses in racing, to optimize these parameters, to properly select young animals for racing, and to devise effective training techniques to optimize performance. Continuation of the present research will focus on specific measurements and statistical determinations of the various parameters for the horses studied. These results will be compared with superb performances by other horses. Based on this information, suggested routines and training techniques will be proposed and a model will be formulated for testing future animals. Needless to say that this “Initial Phase Report” was extremely impressive by Mr. Pollack and his staff. They saw a fantastic method of making Millions by be able to analyze the horses at the races. The following, is only one “bet report” that Mr. Pollack using in many races. He would bet in the Millions of Dollars per race. One can see from the bet above what kind of horses we are talking about. One of them is Spectacular Bid considered the best horse of the time. The person that owned Spectacular Bid was Mr. Myroff which I was introduced to him by Mr. Pollack. Mr. Pollack had some shares in Spectacular Bid also. Now he needed to allow me and Ann to come to collect data with 5 cameras. This is not easy. The purpose had to be kept in total secrete. There is no way this industry would allow such an analysis to show all the “Bets”. There were two race tracks for us to collect data. 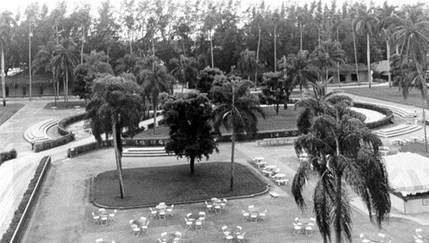 One was the Hialeah Park Race Track in Miami. The second one was in Monmouth Park in New Jersey. Computer Biomechanical Analysis 316 College St. According to the current plans for Specatcular Bid, he will work out on Thursday, August 14 at Monmouth Park at 6 a.m.
will need to set up your equipment so that we will know when to leave the motel for the track on Thursday. I expect to arrive at the Molly Pitcher at approximately 7 p.m.
on Wednesday, August 13. I am looking forward to seeing you and Anne Wednesday evening. Additional correspondence we received from Mr. Grant Gravitt the president of Tel-Air Interstate which was the director of Public Relations at Monmouth Park Racing track. This will identify Gideon Ariel and Ann Penny of my staff who will be shooting still photographs of Spectacular Bid. I would appreciate your issuing press credentials to them. Joe Tanenbaum has obtained permission from Bud Delp for the pictures to be taken. We were present in many races and I will discuss only few of the results we obtain which yield fantastic winning bets for Mr. Pollack and his team. We are talking at least 100 Million Dollars of winning based on our analysis. "when you can measure what you are speaking about, and express it in numbers, you know something about it; but when you cannot measure it, when you cannot express it in numbers, your knowledge is of a meager and un­satisfactory kind; it may be the beginning of know­ledge, but you have scarcely, in your thoughts, advanced to the stage of science, whatever the matter may be..."
Locomotion of any biological system is a complex mechanism which depends on the coordinated interaction of many different subsystems. The basic unit for locomotion is the skeletal musculature which receives neuronal input through the spinal system. It has been demonstrated that the spinal system contains a central steeping generator which can operate autonomously to produce locomotor patterns. 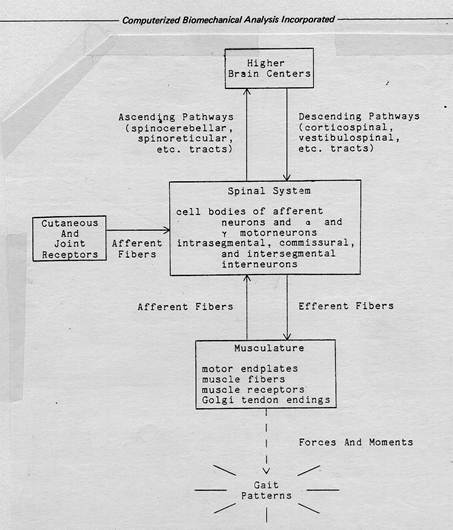 However, under normal conditions, this generator interacts both with the periphery and with systems located in higher brain centers to transmit locomotor information to the musculature. The outcome of muscle activation is the production of mechanical forces and moments. If certain magnitudes of forces are applied to the limb segments in an appropriate temporal sequence, the body as a whole is translated and the individual segments undergo rotations and relative translations. The ultimate expression of this integrated activity of the system is one of the several characteristic movement patterns termed a gait. A simple diagram of this is given in Figure 1. An analysis of locomotion, then, demands neural, muscular, and mechanical considerations. Furthermore, these considerations must be at both the experimental and theoretical level. The former provides the relevant empirical data for the physical phenomena, while the latter enables formalization of the concepts and in many cases provides new insights into the physical phenomena . mammalian locomotion; a survey of these has been given by Griliner for vertebrates and by Wetzel and Stuart for the cat. For bipeds, a significant number of biomechanical studies have been done. Experimental work has yielded a wealth of information concerning phase durations, joint and angle excursions, as well as, force and moment profiles. Control theorists have been able to construct mechanical models of biped locomotion based on these data, and through these models to uncover certain fundamental principles under which the locomotor system operates. In the case of quadruped locomotion, biomechanical knowledge is more limited. Several experimental studies have been done to extract the kinematic features of locomotion. Kinetic data, however, are limited to the pioneer work done by Manter in which spring platforms were used to measure the vertical and longitudinal components of the ground reaction force exerted on the cat during walking. Unfortunately, it is not known how these force parameters vary with velocity nor is it known what they look like for gaits other than walking. The absence of such data severely restricts the level of sophistication possible for quadruped mechanical models. 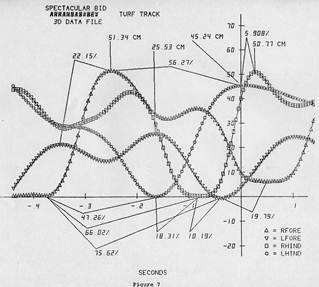 The analytic technique utilized cinematographic data collected simultaneously from multiple high-speed motion picture cameras. This technique of three dimensional biomechanical analysis involves three distinct phases: cinernatographical, digitizing, and computational. In the cinematographic phase, the subject and a set of known points referred to as test points are filmed simultaneously from several angles. The set of known points are objects in the field of view having accurately determined 3-D coordinates and are used to "calibrate" the field of view. This system incorporated three Photosonic high speed cameras stationer' at different locations. These cameras incorporate pin registration for advancing the film and a variable shutter, which was set to 90 degrees, to eliminate any blur at 500 frames per second speed. A light emitting diode driven by a fixed crystal frequency was utilized to calculate exact film speed. The stability of the film speed was measured as better then 0.1% during the analyzed sequences. The film record from a single camera of a given activity is called a view. The three simultaneous views comprise a sequence which is the basic unit of 3-D analysis. While only six known test points in the field of two different views are necessary to perform a 3-D analysis, additional camera views and test points enhance the accuracy of the technique. In this study three camera views and twelve test Points were used for each sequence. The test points consisted of twelve 2 1/2 inch spheres securely fixed to a 3' x 3- x 4" cube. Eight points were placed at the corners of the cube and four in the interior. The array was constructed from aluminum tubing. Among the advantages of this arrangement was the ease with which the cube could be assembled, disassembled, and transported. Its shape was also highly reproduceable between each assembly/disassembly session. Additionally, for the analysis of Spectacular Bid, test points were defined by known locations along the rail and on the rail supports. In order to avoid having the subject obscure the test points, the following procedure was utilized. The test point apparatus was placed on the track in the approximate location where the horses would gallop, and was oriented so that all cameras had an unobstructed view of all the points. The cameras were rigidly fixed and focused and the apparatus was filmed. Next the test point apparatus was removed and the horses were filmed at 200 frames per second as they ran across this path. After the calibration points were filmed, the cameras were not moved or refocused until the end of the activity. 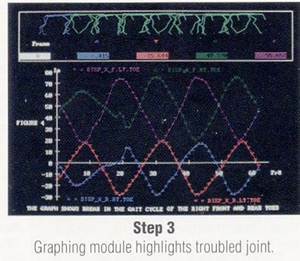 The digitizing phase involves the conversion of cinematographical data to numerical information which is stored in the computer for the subsequent computation phase. For each view, the film is projected, one frame at a time, onto the back of a ground-glass screen while the person digitizing is situated on the other side. As each frame is projected, the points of interest on the image (joint locations and test points) are touched with an electronic stylus and the X-Y position is determined. For each point, the result is a u-v pair (u is horizontal and v is vertical) which is automatically transmitted to the computer. The digitized image is simultaneously displayed on a CRT for visual feedback and verification of correctness. This same sequence of events is repeated for each frame. For the present study, the digitizing order began with the twelve test points followed by the 30 data points for each frame of the film. Figure 4 illustrates the points traced on the horse. In addition to X-Y coordinate data, a synchronizing event (such as hoof impact) was also included in the stored data. 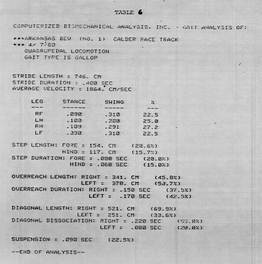 This information was used later during the 3-D calculation phase. test points are used, this set of equations becomes over-determined and a "best fit" is computed using a least squares method. Additional test points and views enhance the accuracy of the technique. information, the time of each frame relative to the synchronization event (the same time in all views) is known. Since the film speeds of different views need not be identical, frames for different sequences may not correspond to the same time. A time interval was selected, in this case every 10 milliseconds, and the u-v information was interpolated to those times for all views using a linear interpolation. In this manner, all views were "synchronized" to an identical time base. With u-v information time matched, 3-D coordinates were computed for each point at each time using the direct linear transformation. Following computation of the 3-D coordinates, a "smoothing" process is performed. The purpose of this smoothing is two fold: (1) to remove random error (which results primarily from digitizing) from the data and (2) to compute the first and second derivatives of position as a function of time (velocity and acceleration). When the computation phase is complete, all quantities are stored in a standard format for subsequent listing, plotting, or display in "stick figure" format. In order to determine the accuracy of the technique, a method was used to calculate the coordinates of points for which 3-D coordinates were already known. A comparison of the computed 3-D coordinates and the known coordinates would demonstrate the accuracy of the technique. A specially machined apparatus consisting of posts of varying heights fixed onto a metal base at 2" intervals was used in this test. The 3-D coordinates for the posts were known to 1/1000 of an inch. The array was photographed from two views. Six of these known points were considered as "unknown" and the technique was used to compute their 3-D coordinates. The largest error was .035 inches with an average of only .017 inches. This degree of agreement indicates that the method demonstrates an acceptable level of accuracy. As the field of view in the horse study is about 30 times larger than in the test just described, the estimated error is about 30 times larger for the horse study. However, the estimated level of accuracy (average error about .5 inch or 1.25 cm) is more than sufficient to perform this study. This method of error estimation was verified during calibration of the test point apparatus which was determined using this technique in a manner similar to that described above. Much of the cinematographical data was collected at Calder, Gulfstream, and Monmouth Park race tracks in April of 1980. Spectacular Bid was filmed at Monmouth Park on Aug. 16, 1980. Each horse was photographed from three views as it ran at a full gallop. A coordinate system was chosen such that X points towards the direction of the forward motion of the horse, Y points up, and Z points across the track (from the infield toward the stands). Prior to each filming sequence, the test point array was moved onto the track, photographed from each camera view, and then moved out of the way. The cameras were securely positioned so that no camera movement occurred between the filming of the cube and the filming of the horse. The results of this study are presented in three different formats. The first is a stick figure representation of the motion of each of the horses in an orientation such that the horse is running from left to right across the page. Figure 6 is an example of the motion of one of the horses displayed in this mode. Notice in this figure how Spectacular Bid does not display his body up and down. He gallop like an arrow. information on the stride as a whole (e.g. stride length, duration, and period of suspension) The data is reported by absolute magnitude and by percentage of a full stride, the latter being useful in comparing animals running at different velocities. A gait analysis is a good summary of the locomotion pattern of a horse since it most directly relates to the horse's efficiency in propelling itself along the track. To better understand just what factors make one horse more efficient or faster than another requires an examination of the more complex relationships between the various body joints and limbs especially in the patterns and magnitudes of accelerations produced by muscular action. For this, graphed results of displacement, velocity, and acceleration are most useful. In the following discussion, information for Spectacular Bid is summarized in Table 2; Midnight Mystique in Table 3; Arkansas Bev in Table 4; and Clayton Delaney in Table 5. It is observed that Spectacular Bid, our "model" horse, exhibits the longest stride length (899 cm) of any of the horses which is a full 20% longer than the next best horse. Despite having a longer stride duration (indications are that Bid was being "held back"), this long stride length resulted in the highest average velocity of the group (2024 cm/sec). 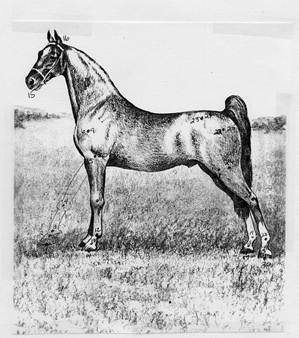 Of the other three horses, Midnight Mystique demonstrated the highest average velocity (1941 cm/sec), followed by Arkansas Bev (1864 cm/sec) and Clayton Delaney (1746 cm/sec). The last horse was running on grass, while the others ran on turf, so a direct comparison of velocity is probably invalid. Midnight Mystique achieved a high velocity through a significantly shorter stride duration (.37 sec, vs. .40 sec for the other two horses), despite having a shorter stride length than Arkansas Bev. Since Mystique is a smaller horse than Bev, the shorter stride length is not unexpected. It appears, however, that Bev is not running at full speed (this was indicated by the trainer at the time of filming). If a similar stride duration could be achieved, Bev could have an average velocity significantly greater than Mystique (2016 cm/sec - close to that of Spectacular Bid). Clayton Delaney exhibits the shortest stride length, and a stride duration similar to that of Bev. Again this may be partially due to the grass track, however it was subsequently learned that Delaney was experiencing shoulder problems, and this may be the prime factor behind the short stride and low velocity. In a comparison of the stance (ground contact) phase and swing (airborne) phase for individual limbs for the various horses, Midnight Mystique exhibited the shortest stance phase (in both time and percentage) of any horse. Grillner (9) indicates that the higher the speed of the animal, the higher the impulse (force times time) and thus the shorter the stance phase for each foot contact. The limiting factor in the animal's ability to produce a high impulse is the individual limb structure and muscular strength. It appears that Mystique is more closely approaching this physiological limit than any of the other horses in the group, as indiacted by the short stance durations (.06 to .08 sec). Thus in considering the "potential" of the various horses, Mystique appears to be running near maximum speed, while the others, assuming that they have the ability to similarly shorten their stance phase through an increase in impulse (i.e. exerting more force) show a potential for an increase in speed of at least 10%. In that case, Bev would be running considerably faster than Mystique, and Delaney only siighly slower than Mystique. Spectacular Bid would still be in a class by himself, a full 10% faster than Bey. It is useful to compare other aspects of the gait analysis so as to determine what relationships in the footfall pattern most influence efficiency in running. Although the magnitude of the fore step length varies among the horses, fore step length as a percentage of stride length is almost constant. Hind step length shows a large variation in both magnitude and as a percentage of stride length. Since a larger proportion of propulsive force is exerted by the hind legs, this variation should be of concern in selecting for efficiency of motion. 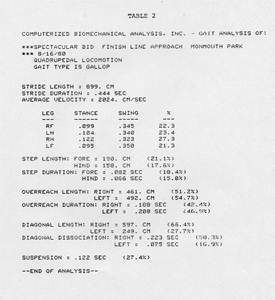 Spectacular Bid demonstrates the longest hind step, the largest percentage of stride length in the hind step, and the longest hind step duration. These combined characteristics result in propulsive force being applied over a larger part of the stride than with the other horses. This in turn results in more efficient propulsion. The horse that most closely resembles Spectacular Bid in this respect is Arkansas Bev. Another factor of concern in stride efficiency is overreach. This is the distance beyond the point of foreleg lift that the same side (ipsilateral) hind leg strikes. Obviously it is directly related to the speed of the horse, but by comparing the percentage of overreach length and duration to total stride length and duration, relative efficiencies in this area can be compared. A long overreach indicates good hind leg extension, which in turn indicates a good use of the large muscle groups in the area of the back and rump. Spectacular Bid again shows his superiority with both the longest overreach and the highest percentage of the overreach to the total stride when compared to the group of horses. 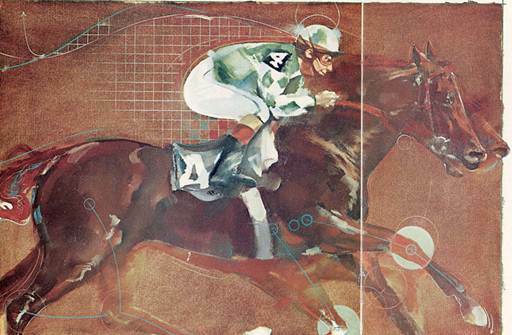 Spectacular Bid also shows the greatest degree of bilateral symmetry, which may be a factor in efficiency of stride. All horses favor one side or the other in normal locomotion and this bias is referred to as "footedness". In this study, Bid and Bev are "left footed" while Mysitque and Delaney are "right footed". However, if one side is considerably less efficient than the other side, then the horse cannot achieve maximum propulsion through the entire stride. Mystique shows the greatest degree of asymmetry in the area of overreach and may be an area for improvement. Bev again shows the most similarity to Bid in this aspect of gait. indicate misdirected force (i.e. too much vertical and insufficient horizontal). However, one must realize that certain positive aspects of efficient locomotion tend to lengthen suspension. The first is good hind leg extension, which is the movement of the hind legs forward during suspension in preparation for the next stride. The second is that increased impulse (higher force between the hoof and ground) results in a shorter time on the ground and a longer time in the air. Spectacular Bid demonstrates the longest suspension, both in magnitude and percentage which is probably due to his excellent hind leg extension. Clayton Delaney shows the shortest suspension hut has poor hind leg extension (smallest percentage of overreach). Arkansas Bev shows perhaps the most efficient suspension phase combining good overreach with a short time in the air. With greater impulse and at a higher speed, however, this time might well lengthen and, thus, it is difficult to draw any direct conclusion in comparison to Spectacular Bid. Midnight Mystique already demonstrates a high impulse (short stance phase), and thus any efficiency increase would have to come through an increase in hind leg extension and a corresponding increase in suspension. The discussion of gait analyses thus far has considered only the horizontal component of the motion of the feet. Brief consideration should be given to the vertical motion of the feet during the execution of a typical stride since this will yield additional information on how each of the horses uses the various limbs during locomotion. Figures 7 to 10 show, for each of the horses, the vertical displacement of the four hooves as a function of time over a full stride. The general pattern for each hoof is the same: ground contact, followed by a rapid raising of the hoof, followed by a forward motion of the hoof during which the height of the hoof may vary, followed by a rapid lowering of the hoof, and ground contact. Within this general pattern, several distinct variations were noted. Midnight Mystique, for example, shows a high degree of symmetry in the motion of the fore legs and the hind legs. Also, the peak height of each foot is almost identical (Figure 8). Arkansas Bev shows good symmetry between the fore legs, but the left hind hoof demonstrates a slow, steady decending pattern, while the right hind hoof performs a "hitch" folowed by a more rapid descent (Figure 9). 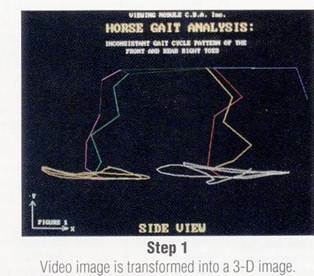 Spectacular bid shows this same hind hoof pattern, with an even more exaggerated "hitch", while his front hoofs show a higher degree of assymetry (Figure 7). In fact, his right fore hoof reaches a peak height of 51 cm while his left fore hoof reaches a peak height of only half that value. This may indicate a strong "footedness" in his gait, or it may perhaps reveal that he is favoring the left foreleg for some unknown reason (perhaps pain or discomfort). Clayton Delaney (Figure 10) shows a lower magnitude of vertical hoof motion which may be due to the grass track. Symmetry is high for the fore legs, less so for the hind legs. In addition to the motion of the hooves, it is valuable to consider the motion of other major body points during the stride. Figures 11 through 13 depict the linear displacement (vertical vs. horizontal) of the upper body points for three of the horses (all except Spectacular Bid). The magnitude of the horizontal and vertical scales are different for Clayton Delaney than for the other horses because of being filmed with a different origin of the "test points". Comparison is still valid as the range of values for the vertical and horizontal axes are the same. Motion of the body points for all the horses follows the same general pattern with the head (nose and ears) showing the most vertical motion through the stride and the withers showing the least. Midnight Mystique and Clatyon Delaney demonstrate considerably more vertical motion in the back and rump than does Arkansas Bev. Reducing the up-and-down motion of these heavy body parts minimizes the motion of the center of gravity and, thus, conserves energy and increases efficiency. Another interesting observation is the lack of smoothness in the motion of the shoulders for Clayton Delaney as compared to Bev and Mystique, especially for the right shoulder. It was learned after filming that Delaney was experiencing soreness in the shoulder, and this may well be indicated by the differences observed in the motion curves. The data collected and analysed in this study demonstrates that differences in locomotion patterns between horses can be measured in a valid and consistent way using the methods employed. Furthermore, measured differences can be related to the goal of maximizing the speed of the horse and the overall efficiency of motion. In a specific sense, this study showed that several "unknown" horses (Midnight Mystique, Arkansas Bev, and Clayton Delaney) could be compared to a •"model" horse (Spectacular Bid) in a practical and straighforward manner. This comparison demonstrated which of the horses (Arkansas Bev) showed the most potential for being able to approach the performance of the "model" horse and which other horse Midnight Mystique) was near the limit of its potential development. successfully fulfilled its role as a pilot study. It is now recommended that these methods be placed into "production" in the form of a continuing program of monitoring the development of individual horses and of selecting horses of high potential for additional training. In addition, it is recommended that various training methods be evaluated by measuring the progress of horses of similar potential under different training regimen. The end result of such a program would be to maximize the returns in a horse breeding and training program through superior selection and achievement of maximum potential. These analyses performed many times in many races. The results gave Mr Pollack an advantage information to make his bets. And he made Millions using our analyses. Let me discuss one distinguish case that happened during out work with Mr. Pollack. Normally, every “Million Dollar Horse” has what is called a pony. It is really not a pony horse, but a “cheap” horse that cost around $2000 to be used as a “runner” for the expensive horses. So, in training in the morning at 5AM the “Pony” stance about 30 feet from the “Million Dollar Horse” and the rider on the expensive horse try to beat the Pony. In our data collection we capture both the pony and the expensive horse. Ann was digitizing all the horses, including the Pony, and when the results came to Miami I noticed that the Pony by the name Arkansas Beve had incredible angular velocity at her hip and knee. In fact she demonstrated gait that was equivalent to Spectacular Bid. When I presented it to Mr. Pollack, we both came to the conclusion that Ann made a mistake. The scope of this book does not allow to put all the vast amount of the data. However, I want to impressed upon you the reader that each horse had very detail data analysis. And Arkansas Bev was as good as Spectacular Bid. Mr. Pollack and I just did not believe it. I called Ann and told her: “Ann you made a mistake with the Pony”. Ann answered: “I do not make mistakes.” Okay, so I begged Ann to re do the data analysis for the Pony. The results came the same. The Pony was the best of all the horses we analyzed to that time. Mr. Pollack decided to have a discussion with me. He said: “If you are right, and my pony is at 70 to 1 add to win, if I put $10,000 on her and she win, I make $700,000.” I agree, but did not want to take such a chance. Mr. Pollack told me that he will do it but only in off track betting. This means he will put the bet in Las Vegas. I told him that I do not want to take responsibility and it is probable that we made a mistake. He told me that he will take a chance. Mr. Pollack put the bet in Las Vegas on Arkensas Bev, the Pony. The add was 71 to 1. He put $10,000. Aransas Bev won by 5 body length and Mr. Pollack won over $700,000. I did not to have any part of it and got paid for the analysis. But Mr. Pollack insist of us having 10 percent. I did not have a choice. I agreed with the Boss. For the next phases of our studies we considered the anatomy of the horse in addition to the biomechanical results. 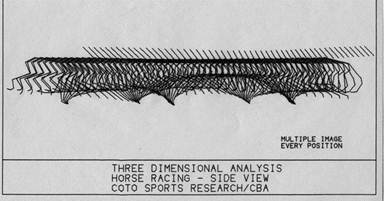 This study is a follow-on to the study entitled 'COMPUTERIZED BIOMECHANICAL ANALYSIS OF THOROUGHBRED RACING' of September, 1980. In that initial project, biomechanical analysis was explained, and its application to the field of race horse evaluation was demonstrated. Subsequent to that study, the horse that was selected as having superior potential based on biomechanical parameters proceeded to 'verify' this method of evaluation by its excellent performance in actual races. The purpose of this second study is to apply the analytical methods developed for and described in the initial study to aditional horses, and to make Practical recommendations regarding the potential and training of these horses. Four horses have been analysed in this study; Marionly, Gotham Hour, Gentle Knight, and Lt. Bert. Film sequences were taken May 4 and 5, 1981, and were subsequently digitized and analysed at both the Amherst and Coto laboratories of CBA. Two types of analyses are included in this study - gait analysis, which considers the footfall patterns and timing during a full stride; and kinematic (motion) analysis, which considers the motion parameters of selected segments and Joints within the body. Tables 1-6 show the results of the gait analysis on the four horses studied, as well as both Spectacular Bid and Arkansas Bev from the previous studs for comparison purposes. Figures 1-14 are graph representations of pertinent kinematic parameters for the four horses in this study. In considering the results of the gait analyses, Spectacular Bid (Table 5) is chosen as the model for comparison. Bid's stride length of almost 900 cm, and average velocity of over 2000 cm/sec shows a clear superiority over Lt. Bert (Table 4), Gotham Hour (Table 2), and Arkansas Bev (Table 6). These latter three horses, however, when considered as a group, show the most similarity of the six horses in this study. All have a stride length between 720 and 750 cm, and a velocity between 1780 and 1865 cm/sec. Of the three, Arkansas Bev has the best gait pattern of the three due to longer stance phase (feet pushing against the ground longer), and a shorter suspension phase (time in the air). Because of this, Bev has the longest stride length and highest average velocity of this group. Conversly, Gotham Hour has the shortest stance phase, the longest suspension phase, and the lowest average velocity. The two other horses in the study stand out as being remarkably different in the gait analysis. Marionly (Table 1) demonstrates the shortest stride length and the lowest average velocity of any horse in the studs (about 60X of our 'model' Spectacular Bid). Though probably lacking the genetic potential of the other horses, much of Marionly's problems arise through poor gait structure. An extremely short stance phase, and an inordinately long suspension phase result in very low efficiency. Much of the muscular effort expended results in keeping the horse in the airy rather than propelling it down the track. 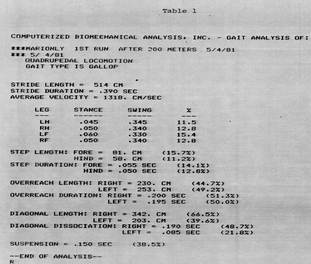 On the other hand: Gentle Knight (Table 3) demonstrates outstanding Performance in the gait analysis. A stride length of 1013 cm and an average velocity of 2265 cm/sec are the best of any horse analysed - a full 12% better than the performance of Spectacular Bid. Admittedly: Bid was not racing a full speed: and there is no indication that Knight could maintain this pace for an entire race: but the results are nonetheless remarkable when compared to other horses in the studs. Gentle Knight's long suspension phase is an indication that perhaps he was riot running at maximum efficiency: though efficiency is lost at very high speeds. In the kinematic analysis: data is presented for the four horses in this study only: as corresponding data was not available from the previous studs. Figures 1-5 show the motion of the horses' hoofs during a full stride (vertical displacement as a function of horizontal displacement). Gotham Hour: Gentle Knight: and Lt. Bert are presented together: one hoof at a time: in Figures 1-4, and Marionly is presented in Figure 5 (all four hoofs). The longer stride of Gentle Knight is immediately apparent from Figures 1-4, as well as longer step length and a higher lifting of each hoof (especially the front hoofs) during the stride, It may be that Knight is a physically larger horse: and therefore is able to generate a correspondingly greater range of motion: but regardless of reason: this greater range of motion yields greater efficiency (more distance in the same number of strides). It can be noticed in Figures 1-3 that the descending slope of the hoof is slightly sharper for Gotham Hour than for Lt. Bert. This higher vertical hoof velocity could be one of the reasons that Gotham Hour has a shorter suspension phase (greater vertical velocity means quicker push-off), and therefore a less efficient gait. Figure 5 shows that not only is the stride of Marionlw considerably shorter than the other horses, but that the vertical lift of each hoof is also much less. The basic pattern of hoof motion is similar to the other horses, leading one to conclude that Marionly is slower than the other horses due to lack of inherent ability, or to lack of condition, rather than to some serious flaw in his gait. Figures 6-8 depict the angle of the back and neck of the four horses during a full stride. Zero degrees is horizontal, positive angles represent segments that tilt 'up' from left to right (horses running left to right), and negative angles represent segments that tilt 'down' from left to right. From strictly an efficiency standpoint, the less angular motion of the back and neck during a stride, the less energy that is expended moving the horse in the vertical direction, and thus the more energy that is Potentially available for moving the horse down the track. Gentle Knight shows the least angular motion in the back (about 3 degrees), followed by Gotham Hour (about 3.5 degrees), and Lt. Bert (about 4 degrees). Lt. Bert demonstrates the most rapid change in back angle during the hind leg pushing phase, indicating that excessive vertical force is generated at this time. Marionly shows the greatest angular motion of the back (almost 6 degrees) which undoubtedly contributes to the inefficient stride parameters of this horse. 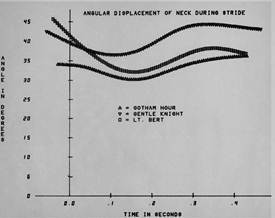 Surprisingly, Marionly demonstrates the least angular motion of the neck, followed by Gotham Hour, Gentle Knight, and Lt. Bert. Neck motion is less critical than back motion, as this is a much less massive segment. The only horse demonstrating excessive neck motion is Lt. Bert whose variation of over 12 degrees would result in needless energy being expended over the course of a race. The final parameter of motion considered in this studs relates to the propulsive force generated by the hind legs. Since the major portion of the propulsive force of the horse comes from the hind legs, and since this force is generated by straightening the leg when it is in a flexed position in contact with the ground, we can compare propulsive forces by comparing the acceleration about the hind leg joints where the predominance of muscular action occurs. In this study we have called these joints the 'knee' and the 'ankle'. Figures 9-14 show the acceleration curves for the four horses about the right and left hind leg joints just mentioned. Positive acceleration means that the joint is opening and the leg is being straightened, while negative acceleration means that the joint is closing and the leg is being flexed. It will be noticed that the largest accelerations occur from the mid-point of the stride to the end of the stride, but this is the suspension phase of the rear legs, and thus these accelerations produce no propulsive force. Rather, the portion of the curves of interest is approximately the first third, where one rear leg and then the other contact the ground and push off. 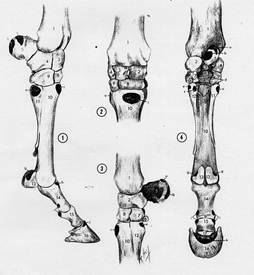 Figures 9 and 11 show the 'ankle' joint accelerations for three of the horses. The area of concern is the peak following the first large dip. This is the push-off acceleration, and as can be seen, the three horses have approximately the same accelerations, with Gentle Knight being slightly higher in the right 'ankle' and Gotham Hour being slightly higher in the left 'ankle'. Marionly (Figures 11 and 14), shows accelerations at push-off slightly lower than the other horses for the 'ankle' joints. 'Knee' joint accelerations (Figures 10 and 13) show more variation between the horses studied. 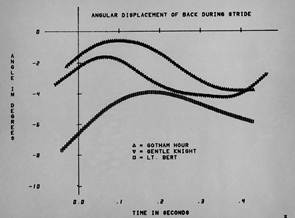 For the right 'knee', Gentle Knight demonstrates about twice the push-off acceleration of either Gotham Hour or Lt. Bert, and for the left 'knee', the latter horses generate very little push-off acceleration while Gentle Knight develops an acceleration slightly greater than the right 'knee'. The muscles around the 'knee' joint are more Powerful than those around the 'ankle' joint, so this large difference in acceleration is suite significant in the performance of these horses. It is here that the superiority of Gentle Knight can be seen, as by using the muscles around both the 'knee' and 'ankle' joints effectively in push-off he is able to develop much greater force in his stride, and therefore a higher velocity and longer stride length. In comparison, Marionly (Figures 11 and 14), shows low acceleration levels in both the right and left 'knee' joints (less than half the levels of Gentle Kinght), thus contributing to the poor performance of this horse. most part, in a similar manner, about midway between Gentle Knight and Marionly. considered a 'cull' based on the observed Poor Performance characteristics. However this horse has been undergoing an intensive training program in an effort to substantially increase Performance, and thus value. A follow-on analysis of this horse should be done as soon as possible to monitor improvement, if any, and to verify the training method. 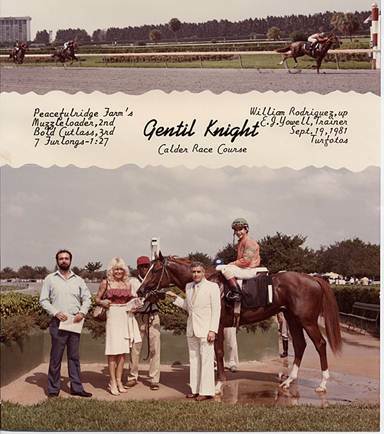 Gentle Knight should be raced, and an analysis under race conditions, if possible, should be performed. If this horse is riot able to maintain its observed outstanding performance characteristics for the duration of a race, then a training effort should be begun to achieve this goal. Gotham Hour and Lt. Bert present a valuable opportunity to validate and refine training methods. At this point, the two horses have very similar performance characteristics. By choosing one of them for training using the methods devised by CBA/Coto Research Center, and by continuing the other in the traditional training procedures, actual quantitative comparisons of improvement resulting from differing training methods may be achieved. I have noticed that the horses lose great deal of time by sinking into the sand on every stride. I suggested to Mr. Pollack that we can experiment with a Polyurethane shoe placed over the hoof joint. It was legal and no one thought about it. We made the shoe in a special shoe manufacturer and tried it on various horses. They all improved their time by at least one second on 8 furlong track. Mr. Pollack tried it on few horses during the races. No one knew about these trials. In all cases the horses improved upon their time significantly and the financial gain with it were shown. Eventually, me and my staff at the race track was noticeable. The other horse owners did not like it at all. One day Ann and I came to our room to find that all our cameras were broken. A note left on our bed and read the following: “Your knees are next”. We knew, we need to get out of this business. And we did. But others bought our system and use it for their research. 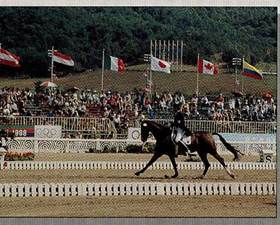 In the 1988 Olympics in Barcelona, one of our customer, Hilary Clayton, BVMS, PhD. Already used the APAS system to analyze the gait of the horses participated in the Olympic Games. I used to correspond with Hilary and directed her how to set the cameras to collect data for my Analysis System. The APAS System (Ariel Performance Analysis System) does not care if it is a horse or a human. Any movement can be quantified utilizing Newtonian Equations to measure kinematics and kinetic of movement. In the Olympics, a multitude of cameras were focused on Barcelona, where they will capture Olympic athletes in motion for sports fans worldwide. This was done with my cameras. But there were also several cameras whirring away at the equestrian events with a pur­pose quite different. You will not see the images preserved on film by these cam­eras on your TV, and though they'll be viewed and reviewed many times over, it will never be to the brand strains of allow three-dimensional views to be con­structed, since important landmarks on the horse's body (such as centers of joint rotation) will always be visible by at least two of the three cameras. The World Equestrian Games Stockholm) offers unique opportunity to analyze some of the same horses four years apart. With her studies, she hopes to help answer one of the prime questions in gait analysis research: does a horse possess cer­tain gait characteristics that are essential for superior performance. equine athletes for gait analysis. Together with several scientists from Spain, Clayton was videotaping the most dif­ficult of dressage movements: the piaffe, a stylized trot in place, and the passage, a very slow trot with exaggerated elevation of the limbs. The Olympic contenders must execute two passage-piaffe-passage sequences in the center of the arena and their performances at these movements account for 25% of their total marks. Three cameras were set up along the edge of the arena captured a minimum of six steps of passage preceding and following the piaffe, the piaffe itself and the transi­tions between them. Clayton with our system also positioned the three video-cameras at the show jumping event in order to record world-class horses going over a selected fence. These tapes includec the final approach stride, take off, airborne phase, landing and the first stride as the horse moves off to continue the course (the recovery stride). In each case, the location of the cameras were immutable over time? If the answer is "yes" and if those characteristics that mark a horse exceptionally talented for a chosen sport can be identified, then gait analysis may emerge as a very useful selection tool when making purchasing decisions. Muybridge "freeze-framed" his first horse in the late 1880s and showed the gallop to be a four-beat gait. Since then, advances in technology have brought about the ability to film horses with high-speed, motion pic­ture cameras or videocameras capable of recording hundreds of frames per second (compared to the rate of 30 frames per second for standard videocameras). Later, when the film or tape is played back very slowly, frame by frame, details of the action emerge that would escape even the best observer, since the human eye cannot distinguish events occurring in less than 1/10th of a second. Translating these action details into numbers (quantifying the data) is the next step in motion analysis. A multitude of measurements can be taken, depending on your interest and purpose. For example, suppose you would like to know something about your horse's stride characteristics. By measuring the distance on the screen between successive imprints of the same hoof (or better yet, taking the average dis­tance between successive imprints of all four hoofs) and comparing it to a marker of known length, you can calculate stride length. If the camera is equipped with a timer, figuring stride duration becomes a simple matter (otherwise, since the record­ing rate is known in terms of frames per second, you can derive stride duration by counting the number of frames it takes to complete one stride). From there, stride frequency and velocity can be computed. Joint angles, vertical movement of the croup and withers, breakover time, the relative positions of the limbs at each phase of the stride and the timing of each hoof placement are other calculations that may be important in studying the biome­chanics of your horse in motion. In fact, depending on the angle of the cameras) and the points of reference, the number of ways in which a horse's gait can be quan­tified is almost unlimited. And if you take the horse over a force plate, you've got a whole new set of variables to measure. Not only can you examine the geometry of movement as the limbs travel through space (kinematics), but the force plate allows you to study the forces that cause movement (kinetics). Although quantifying gait characteristics makes it possible to answer all kinds of how much, how fast, how far, how high, how long and how wide questions, gather­ing the data necessary to do so can be a very time-consuming and tedious process. Enter computer technology, and motion analysis picks up speed. Digitizing trans­lates the location of anatomical landmarks into coordinates, and these numbers are stored by the computer and fed into equa­tions that calculate the variable of choice. The APAS software coupled with a com­puter's renowned ability to perform com­plex number-crunching faster than a speeding math teacher allows the raw data to be transformed into graphs, charts and even moving stick figures. You could gather a mountain of measure­ments and calculate and chart different variables on your computer to your heart's content, but the trick is to sift out the infor­mation that is relevant to your application. What can motion analysis tell you? In humans, biomechanics has found suc­cessful application in several areas. In orthopedic medicine and rehabilitation, a injury's mending progress can be monitored; in manufacturing or business settings, methods enhance efficiency of certain job tasks can be found; and in sports medicine, motion analysis has been used to improve athletic per­formance in a variety of sports, including golf, track id field, baseball and ten­s. Motion analysis has aided in the development of a space suit for NASA. For the APAS system, thoroughbreds, dressage horses, jumpers and cutting horses. Once normal equine kits were described, exceptions on both sides of the spectrum could be distinguished. At one end are horses whose gaits device from the norm because they are lame. these cases, gait analysis plays a diagnostic role. To check for soundness or hoof ,lance, horses are usually filmed at the trot since this gait is inherently symmetrical and any signs of lameness (i.e., any .disruption of symmetry) are exaggerated this pace compared to the walk. For sample, suppose you taped a sound horse .owing at a leisurely trot, then viewed the tape in slow motion. You may be surprised see that the diagonal limb pairs do not strike the ground simultaneously, as it is commonly thought they do. Instead, the hind limb often precedes the fore both at Hof impact and lift-off. But in a horse is lame, the sequence and timing of limb placements and lift-offs may differ on the right and left sides. Horses undergoing rehabilitation may so benefit from gait analysis. Just as physical therapists could use biomechanics analysis to evaluate a patient's. A clinician could compare a horse movement before and after treatment to help evaluate its effectiveness. At the other end of the gait spectrum 'e talented horses who perform in a superior manner. Their ability to move more economically or efficiently than their less gifted peers contributes to their success in competi­tion. When a superstar comes along only too rarely, the contrast can be spectacular, as in the classic case of Secretariat. Studying Seoul dressage competitors, Deuel discovered that stride characteristics at the extended trot and canter were quite consistent with overall scores. Highest marks went to hors­es who had the longest, fastest strides and dis­played the greatest degree of extension. Gold-medalist Rembrandt clearly gave an outstanding performance: his stride length at the extended trot measured a full 15 feet, compared to "only" about 12 feet for the other horses. Deuel also noted that winning jumpers at the 1988 Olympics differed in their recovery strides after negotiating a fence compared to their competi­tors. Successful horses had briefer time inter­vals between hind limb impacts and briefer time intervals between fore leading limb contact with the ground and the initiation of the next stride. Fewer penalties were gar­nered by horses whose hind limbs were planted closer together during takeoff and whose forelimbs landed nearer each other. There are still some questions to answer before gait analysis can be used rou­tinely to pick the youngsters that will go on to become stakes winners, futurity stars or Olympic contenders, and weed out early those that are structurally disadvantaged or poorly coordinated. It is generally accepted that an individual's inherited movement patterns can be enhanced by practice (your piano teacher didn't say "Practice makes perfect" a million times for nothing — those drills induced subtle refinements in your neuromuscular coordina­tion to translate notes on a page to accurate movements of your fingers). However, researchers are just now scratch­ing the surface to understand how much equine gait characteristics change over time due to training and/or maturity, and which character­istics are reliable predictors of ability in a giv­en sport. To complicate matters, the final per­formance is more than just the sum of the horse's innate talent and any improvements through training. It involves the ability of the rider or trainer, the nature of the working sur­face, furriery modifications, the overall health of the horse and that elusive, unquantifiable quality, "heart." ·quantifiable (you can change your ques­tion from "Is this horse lame?" to "How lame is this horse?") and permanent (a film or tape can be replayed again and again, forming a baseline for comparison or part of an archive; the stored data can be analyzed and presented in innumerable ways to give a clearer picture of what is happening). In addition, the technology is now more accessible than ever. The APAS allows for three-dimensional evaluation of the horse's performance dur­ing any activity. Three-dimensional analy­sis allows for prediction of injury, improve­ment of technique and the evaluation of treatment for the injured horse. The APAS allows the potential owner to perform a full evaluation of a horse's poten­tial. It also allows the potential owner to predict the possibility of injury based on forces which are not visible to the human eye. The subtle aspects of a horse's move­ments which impede performance in jump­ing, racing and aesthetic form can be clearly identified and corrected through the use of APAS. The APAS allows the owner or trainer to evaluate the performance of each joint and segment of the horse's body. This allows for clear-cut training programs to return a horse to its optimum performance. Returning a horse to its pre-injury perfor­mance is often difficult. The APAS allows the trainer to determine the specific muscle groups which have not returned to their original performance level by analyzing the deficiencies in limb movement. This tech­nique allows for better understanding of the extent of the injury and the best course for the horse's rehabilitation. To summarize, the same system that we were using for Olympic athletes to achieve their Gold Medals was used the same to maximized the performance of race horses. Generated on 4/20/2019 11:24:37 AM (PST) ADI/HQ/GBA/2019/ARIELCLOUD/v3.0.2018.0126.